Naming all the superheroes nowadays would truly end up filling quite a long list and there's no doubt that from that list you may have still missed out some. This is testament to just how massive the superhero genre has become in the Entertainment industry, particularly in films and Television Shows. Nowadays, another industry has come to the fray and get a bite out of this action - the slot industry. Merkur Gaming has taken the initiative to join the bandwagon of software who aims to provide superhero-themed games but, the brand has made sure not to just depict any type of superhero. 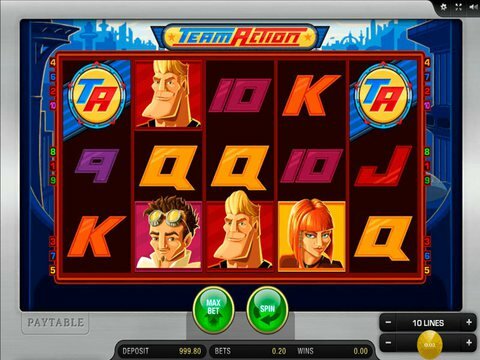 Instead, it created its own ballistic, powerful heroes which resulted to the Team Action Slot machine. This newly added game to the oeuvre of superhero-themed games is particularly hot for Canadian Gamblers right now and the Team Action free play slot demo in this page will give you a glimpse of why it is beloved by players. Just like any other superhero movies, games and slots nowadays, superheroes and villains always have a base city where the action takes place. The game features a metropolitan area tinged in a blue veil of silhouette, giving the game a fresh and novelty look. The reels at the center contrasts beautifully with the background while also making sure that it makes the symbols more eye-catching. These cutting edge 5 reels matrix at the center is equipped with up to 10 fixed pay lines and from this, it is apparent that the winning chances in every spin is not the greatest in the industry but, not the worst as well. Bets in the game can range from a penny to 10 coins per spin and at maximum, you'll stand a chance to win a massive 5000 credits. It may not be that much but, considering that you can get that from 10 coins is an absolutely monstrous jump in bankroll if you get lucky. Aside from the Team Action Slot machine main characters, there are also card icons in the game and of course, the Wild Team Action symbol of the game. It has in its palm, the highest payout of the game but other than that, it also acts with substituting capabilities with x2 multiplier if it is included in a winning spin. With the right conditions, it can also use its scatter capabilities to award free spins and during these free games, the heroes can be the wilds of each other for easier way of getting winning combinations. A unique superhero game that's bound to reel you in with its exquisite quirky prime character is the Super Lady Luck Slot from iSoftbet. It is equipped with one of the most jaw-dropping aesthetic and features packed in a 5-reel and 243-payline gameplay that's certainly in the game to bring its players with stupendous winning opportunities. Get to enjoy the thrilling action of the Team Action Slot Machine at Lvbet Casino where your bankroll will be boosted to new heights with their endless promotions, which will surely get you hooked to play at their site even more. They have a one-of-a-kind LV Wheel bonus, free spins bonuses, reloads and more to entice you further into the site.